Place the water, salt, and sugar in a pot or bowl and whisk to dissolve salt and sugar. Add the turkey breast and cover. Let it sit in the refrigerator for at least 12 and up to 24 hours. Preheat the oven to 425. Remove the turkey breast and pat dry with paper towels. Discard the brine solution. Sprinkle pepper over the turkey. Toss the sweet potatoes with the oil, thyme, salt and pepper. 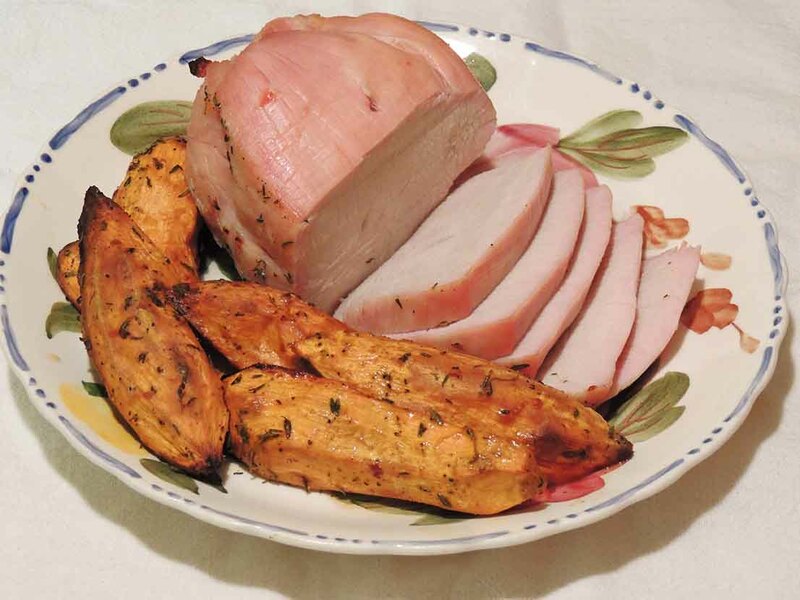 Place turkey breast in a roasting pan and arrange the sweet potatoes around it. Roast for 1 hour, or until an internal thermometer reads 16o. Remove from the oven. Cover lightly with foil and let sit for 10 minutes before slicing the turkey breast. Cut into slices and serve with sweet potatoes.